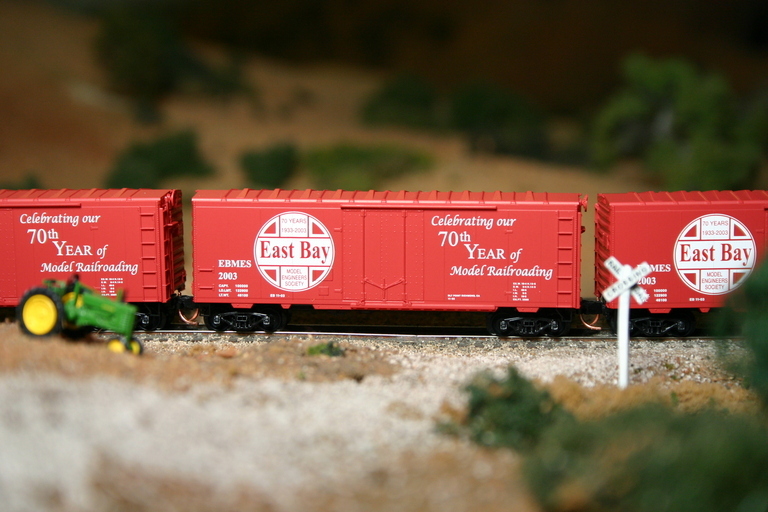 (Click for larger image) The East Bay Model Engineers N Scale Division is proud to announce the release of its first custom-run Micro Trains N Scale car. These cars are now being released for sale to the general public and commemorate the 70th Anniversary of the East Bay club, founded in 1933. The East Bay Model Engineers operate the three layouts on display at the Golden State Model Railroad Museum in Point Richmond, California (www.gsmrm.org). The car is a Micro-Trains Special Run in the 74000 Series. 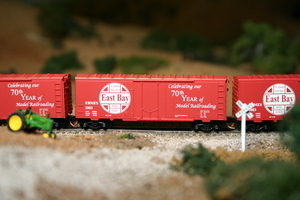 It is a 40 ft. box car, no roofwalk, plug door, decorated in the Santa Fe style and incorporating the East Bay logo. Cars are available at the Museum or via mail order (see deails below). The cost for each car is $9.95 (plus applicable tax and shipping). Profits from the sale will go into a special N Scale fund for future layout projects. The N Scale Division of the Golden State Model Railroad Museum operates a 2,000 sqft layout depicting the Southern Pacific in California. Highlights include Donner Summit, Elvas Wye and the Tehachapi Loop. To purchase your own car, please visit our online store!